It’s been proven that a lack of sleep can cause so many physical symptoms like weight gain, increased blood pressure, dementia risks and lower immunity. Mentally we become more negative and unable to make our best decisions when we are tired,. How often do you reach for a chocolate bar or cake to ‘keep you going’ through a busy day? Matthew Walker, author of How We Sleep has been studying sleep for the last twenty years. In his article in The Guardian last year he said it was his conviction that we are in the midst of a “catastrophic sleep-loss epidemic”, the consequences of which are far graver than any of us could imagine. So how do you sleep? Are you a straight eight hours a night person, or do you struggle like around half the population? After I suffered a stroke in 2010 I had endless pain as my arm tried to mend itself. Night after night I would pace our house. My mental health plummeted, along with my mood and I told my husband that cutting my arm off would be so much better than the pain! I was prescribed some awful medication and then I did get eight hours of deep sleep. The relief was amazing and my blood pressure started to fall from the 203/125 that had so worried my GP. The trouble was I was a complete zombie by day, struggling to string my thoughts together – and I had a business to run! So how can we give ourselves the chance of a good night’s sleep? Tell yourself, “I always sleep well.” Even when you don’t, keep saying it – what we think about comes about! 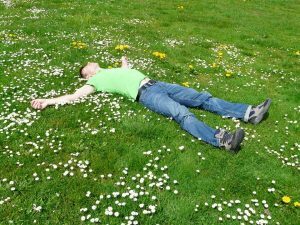 Avoid tech for an hour before bed, sleep in a dark room and use techniques such as meditation. Try a calming breathing technique. Breathe in for the count of four, hold for six and breathe out for seven. Repeat three of four times. If nothing else all that counting stops you thinking about your busy day or what to not forget for tomorrow! Make sure you get some exercise through the day as this can be a great way of ensuring sleep. Even if it’s a gentle walk, we all know the benefits of fresh air and movement. I talk about ‘bounce’ as being our energy and zest for life. Regular, good quality sleep will keep you in a positive state and allow you to make the best decisions that are right for you! *Do you want to hear my full story? 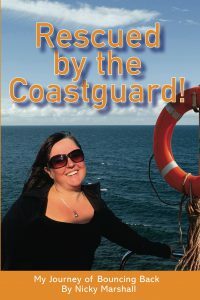 Rescued By The Coastguard, My Journey of Bouncing Back is available on Amazon in paperback and Kindle versions. Nicky is an international, award winning author and speaker and owner of three companies. Nicky has a background as a Management Accountant but has been running businesses since 2006. Nicky is a wellbeing advocate, passionate to show that people are amazing and capable of great success - when they have the right techniques and enough energy! After suffering a stroke at 40 and fully recovering, Nicky is on a mission to change the wellbeing of the world - one person at a time.